What Drives a Chimp to Murder? Between 1998 and 2009, John Mitani witnessed 18 murders firsthand, and found circumstantial evidence for three more. But no police were ever called, for these killers were all chimpanzees, from the Ngogo community in Uganda's Kibale National Park. Chimpanzees are highly intelligent animals, capable of great acts of empathy, technological sophistication, culture and cooperation. But they can also be murderers. Groups of chimps, mostly male, will mount lengthy aggressive campaigns against individuals from other groups, attacking them en masse and beating them to death. Their reasons for such killings have long been a source of debate among zoologists, but the aftermath of the Ngogo murders reveals an important clue. After the chimps picked off their neighbours, they eventually took over their territory. It seems that chimps kill for land. The vast majority of these murders were carried out by groups of Ngogo males on patrol. These patrols are stern, single-file affairs. Males march along the borders of their territories, scanning for other chimps and neither feeding nor socialising. They monitor the northeastern part of their territory with particular fervour and indeed, 13 of their 21 kills took place here. Of these victims, 4 were adult males and 9 were youngsters. That may seem like a small number, but for chimps, these are severe losses. At the hands of the Ngogo attackers, the northeastern community was experiencing death rates that were 23 to 75 times higher than those observed in other groups of chimps. They were even higher (by around 5 to 17 times) than the death rates due to violence between groups of human hunter-gatherers. 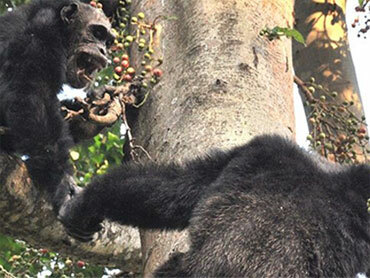 It's clear that the Ngogo chimps are skilled at waging war against their neighbours and the exceptionally large males in their number probably contribute to their aptitude for violence. And because of their aggressive tactics, they have increased the size of their territory by some 22%, expanding into the northeast area that their neighbours once called home. With murder came new real estate to colonise. Mitani's observations back up other anecdotal evidence from other parts of Africa. In Gombe National Park, the Kasekala community of chimps took over the territory of the neighbouring Kahama clan after a series of fatal attacks. But the former community actually splintered off from the latter some time previously. Elsewhere in the Mahale Mountains, one group of chimps annexed the territory of another. All the males in the latter group mysteriously disappeared, but no murders were ever directly witnessed. In contrast, Mitani found clear and direct evidence that the Ngogo chimps killed off their rivals and commandeered their land. These observations don't rule out the alternative ideas that the attacks were motivated by a desire for more mates. After all, more acreage could attract more females into the group or improves the chances of existing members. But Mitani's observations do rule out at least one idea behind chimp aggression - that it's a side effect of humans. Some zoologists had suggested that by providing food to wild chimps, we were instigating conflict between them, but that's clearly not the case in Ngogo. Much of this behaviour might seem familiar, for it has poignant echoes of human warfare. After all, we also kill each other over resource. Richard Wrangham, a primatologist from Harvard University, has suggested that understanding the reasons behind chimp violence could help us to understand and address "the roots of violence in our own species". Even so, Mitani is very careful about drawing an analogy between chimp and human aggression, given the myriad of reasons that humans have for waging war. Chimp expert Frans de Waal appreciates his caution. He says, "There have been claims made in the past that since chimps wage war and we do as well it must be a characteristic that goes back 6 million years, and that we have always waged war, and always will. "There are many problems with this idea, not the least of which is that firm archaeological evidence for human warfare goes back only about 10-15 thousand years. And apart from chimpanzees, we have an equally close relative, the bonobo, that is remarkably peaceful. The recent discovery of Ardipithecus also adds to the picture, as the suggestion has been that Ardi was relatively peaceful too. The present study provides us with a very critical piece of information of what chimpanzees may gain from attacking neighbours. How this connects with human warfare is a different story."